In Breezy Point, N.Y., a Queens neighborhood that lost more than 100 homes, endured catastrophic damage. NBC's Brian Williams reports. Breezy Point, in New York City's Queens borough, was built in part by New York City firefighters and their families in the early 1900s. A large section of it was destroyed by Hurricane Sandy, in part because firefighters couldn't get there. The idyllic community of around 3,800 homes – many wooden bungalows, packed tightly together – sits on an isolated spit of land, connected to mainland New York City by two bridges. It enjoys both bayside and ocean views, a luxury that makes it a target for both New Yorkers and every large storm that roars ashore from the Atlantic. But it wasn't rain or wind that did in Breezy Point – it was fire and logistics. At the height of Sandy's fury late Monday, when a devastating blaze ignited in the heart of the community, firefighters were slowed by flooded roadways and other weather-related challenges, finally requiring help from the National Guard to get through. As they were working out an approach, flames fueled by massive winds jumped from home to home, consuming family histories along with the buildings holding them. By the time the blaze was contained, more than 100 homes – and St. Genevieve's Catholic Church – were destroyed, ripping the heart out of the community. Breezy Point is sometimes called the Irish Riviera – or by its Gaelic name Cois Farraige, which means "By The Sea." Irish police and firefighters looking for affordable seaside homes rushed to build in the area when transportation to and from the city became readily available just over a century ago. It has remained one of the most Irish enclaves in America, with more than half the residents claiming Irish heritage, according to the U.S. Census Bureau. Nicole Makridis, who lives in a ground-floor condominium in Breezy Point, across the street from Rockaway Beach, took this photo on Tuesday when she returned to assess the damage from Sandy. The dark band on the wall shows how high the floodwaters climbed in her unit. "If you are interested in learning anything — the bagpipes or the tin whistle or Irish dancing," Breezy Point is the place, Dolores Mulholland told the Irish Echo, a New York-based newspaper aimed at Irish immigrants, in a feature story on the neighborhood last year. Even Frank McCourt, the famed chronicler of Irish-American life who wrote "Angela's Ashes," once lived there, but few outsiders have the chance. Property rarely comes up for sale, and when it does, buyers must come up with a 50 percent down payment required by co-op rules. The Breezy Point Cooperative, which governs the area, pays for its own security force, and is one of the rare spots in New York City where the fire department is still run by volunteers. They were no match for the record-breaking storm and fire that gutted the place early Tuesday morning. The blaze did not discriminate. Rep. Robert Turner, R-N.Y., who won a special election to replace disgraced former Rep. Anthony Weiner last year, lost his home in the blaze. So did state Conservative Party Chairman Mike Long. In Breezy Point, Queens, Sandy's flood damage was compounded by a massive fire, and the devastation was compared to post-WWII Berlin. NBC News' Hoda Kotb reports. 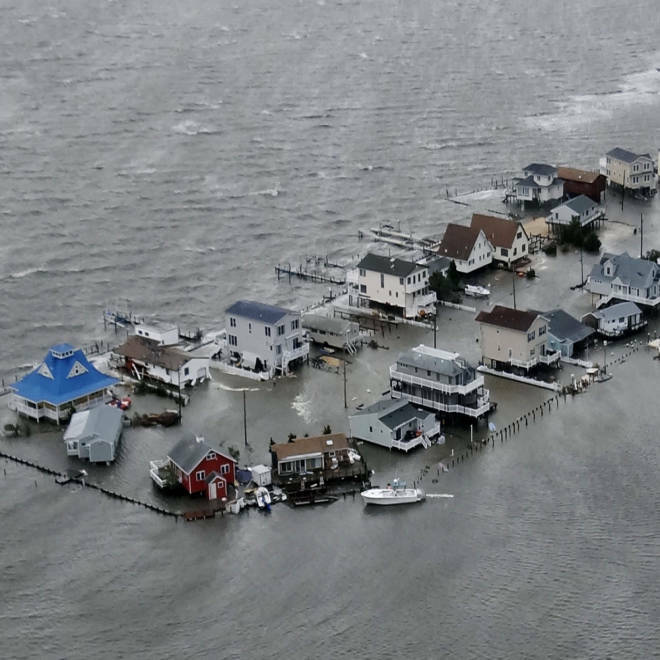 Breezy Point was under mandatory evacuation orders when Sandy rolled in, so many residents spent Monday night watching terrified on television, or scanning the Internet, looking at distant images showing their beloved beach community engulfed by water and flames. They hoped friends and family got out in time, and hoped their homes could dodge the triple threat of wind, flood and fire. Few did. 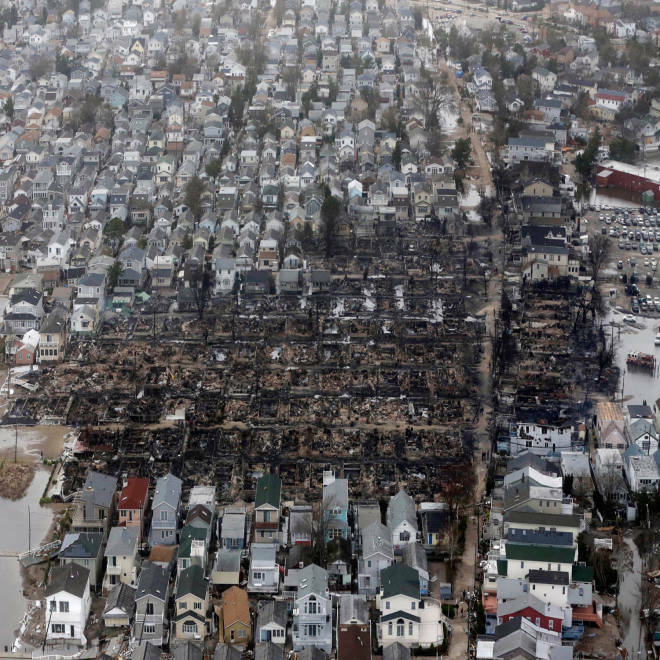 This aerial photo shows burned-out homes in the Breezy Point section of the Queens borough New York after a fire on Oct. 30. The tiny beachfront neighborhood told to evacuate before Sandy hit New York burned down as it was inundated by floodwaters, transforming a quaint corner of the Rockaways into a smoke-filled debris field. Max Countryman got an alarming text from his mother, Paula, in the early morning hours on Tuesday asking if there was a fire on Breezy Point. Paula and her partner had decided to ride the storm out, as she and Max had ridden out Hurricane Irene with little trouble last year. "I can see a fire from my house," the text said. Max had left his mother at her Bedford Avenue home only a day earlier, after scoring a ticket on one of the last pre-storm flights out of New York. Back home in San Francisco, after Paula's electricity, phone and Internet service went out, he had to rely on her texts, news reports and, finally, the Web. Breezy Point, N.Y., home to 9/11 responders who lost their lives, suffered devastating losses as a result of Sandy. NBC's Mara Schiavocampo reports. "I was just listening to the Fire Department scanner (online) all night," he said. "I listened to the progression of the fire, when it went from one alarm, to two, three, four, five, six alarms. ... It was horrible to listen to the traffic, hear another block is engulfed in flames, another block, and they just couldn't stop the progression." He took to Twitter to ask for help, but soon learned there was no way for his mother to get off the island. At first, he was more concerned about flooding. "I'm in contact with her. But there's probably not a lot to do but wait," he told one user. "There's a second floor and deck. And I suppose there's always the roof. But for now it's not that bad." But quickly, fire became the bigger worry. "Breezy Point is in dire shape at the moment: between twelve and fifteen homes are on fire, a church is burning, and the FDNY is stuck," he wrote. A little later, he tweeted: "@FDNY what's the status on the 3-alarm in Breezy Point? My mom is stuck (on) Bedford Ave, fire is not too far away." Then, this, a moment later: "@FDNY ... What should people stuck on the point do as the fire approaches their homes?" About the same time, Chelsea Taylor was sweating out the storm and fire from her home in Bensonhurst, Brooklyn. For Taylor's family, Breezy Point has been like an extended family hotel for the past two decades. Her sister Nicole Makridis lives on Bayside Avenue; her aunt, uncle and their two kids live next door. The boardwalk that used to grace Rockaway Beach washed across the street and ended up at the front door of Breezy Point resident Makridis and her neighbors. "I was basically raised over in Breezy Point because of a beach club over there and it was absolutely beautiful," she said. "I've spent endless summers over there and a lot of my high school friends live over there." Before Sandy’s landfall, Makridis had evacuated to Taylor's home, but the other family household stayed behind. Taylor found out during the night that parents and kids – a 3-year-old and a 9-year-old – were evacuated by boat, but she couldn't find out where. "(I) found out they were evacuated by boat to the clubhouse. I have no idea where that is though," she told NBCNews on Tuesday. "It was the 9-year-old's birthday on Saturday," she added. The uncertainty and fear were felt by many others with roots in Breezy Point. Chris Gavagan is a filmmaker living in Brooklyn who grew up on Breezy Point; his father and brother still live there. His father retreated to ride out Sandy in Brooklyn, but brother Rob stayed behind in Breezy Point. When Chris Gavagan discovered Max Countryman's tweets about this mother, the two shared notes and determined that Countryman's mother and Gavagan's brother were neighbors. "My brother (we haven't heard from since 8p) lives about 100ft away. The Army is involved now," Gavagan said on Twitter, referring to the National Guard. Countryman never lost contact with his mother through the frightful night. While she couldn't place calls, text messages continued to work and her cellphone battery held out. He knew when her first floor filled with 4 feet of water. As the night wore on, he heard on the FDNY scanner activity that wind had blown the fire the opposite direction, away from his mother's house. Then, after the high tide waters receded, he figured she was out of immediate danger. He still had no idea how to help her, however – and his mother and her partner didn't know what to do next. "They were going to try to rent a car, or somehow get a car – my mom's partner hadn't heard from her mom, so they want to go into Brooklyn and check on her," he recalled. "But it's probably impossible for them to leave the house." He reflected on his mother's decision to stay, and said it was complicated. Their first option was to evacuate, but the nearest family member's home – in "Zone A" in Brooklyn – was also under a mandatory evacuation order. The couple has two dogs and a bird, making evacuation to anywhere else challenging. Such potentially life-threatening calculations were not unusual. The Wall Street Journal reported that perhaps 60 percent of Breezy Point residents tried to ride out the storm there. 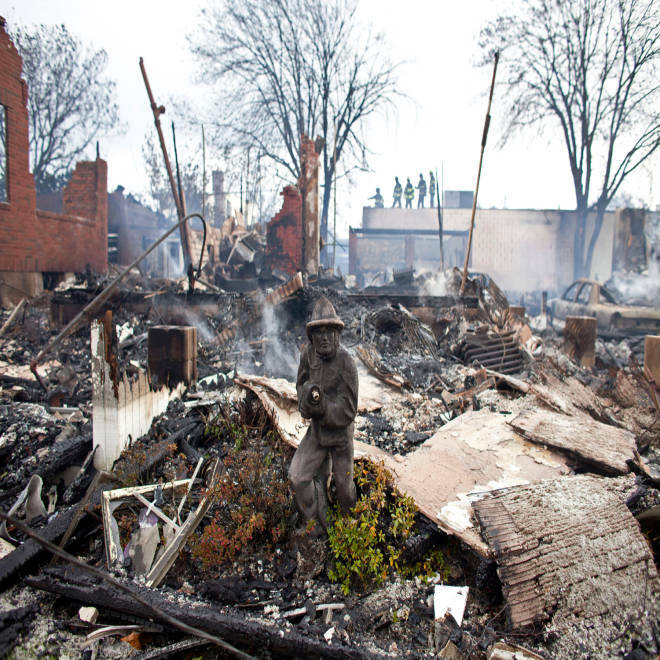 A firefighter garden gnome stands as a lonely sentinel if a swath of Breezy Point, N.Y., destroyed by fire on Monday as Hurricane Sandy battered the community. Nonetheless, as the weather began to clear on Tuesday, he wondered aloud why his mother wasn't getting more help leaving her badly damaged home. "You'd think the National Guard would want to step in and evacuate, maybe make an attempt to get people out at dawn. But right now I don't know what they are going to do," he said. Gavagan got good news, too, as he was able to make it to Breezy Point Tuesday to check on his brother in person. Rob Gavagan and his father, Donald, assess the damage from superstorm Sandy in front of the elder Gavagan's Breezy Point home on Tuesday. "(My brother) rode it out in a house where taking on water was the concern. 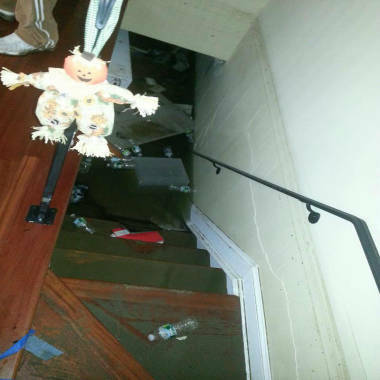 He had a few feet (of water) in the house," he said. Perhaps for the best, he said, brother Rob didn't know about the fire because he was too busy caring for their home. 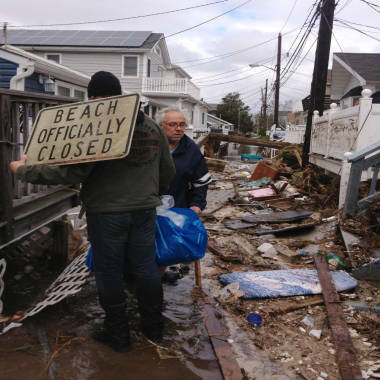 A picture Gavagan sent to NBC News shows his father and brother already cleaning up debris around the house, carrying away a sign that reads, "Beach Officially Closed." He was able to let Countryman know that he'd seen his mother's home. "The sidewalks and areas around her house still have feet of water, but there is plenty of help now," he said. He also reported that the National Guard was on the scene, but didn't know if they were evacuating residents. For others, relief was delayed and tempered by the loss of treasured memories. Chelsea Taylor was still waiting late Tuesday to hear where her uncle, aunt and their children ended up, assuming they were OK but worrying nonetheless. Her sister was able to make her way back to Breezy Point to get see the damage, but that did nothing to lighten her mood. "Looking at the pictures my sister just showed me of her house is absolutely heartbreaking," she said. "Her whole house is completely flooded. "The flooding is unbearable. She lives on a floor level condo right across the street from the beach in Rockaway. 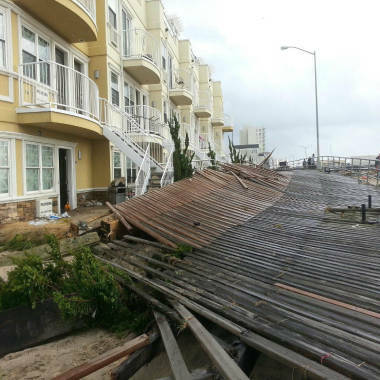 … The boardwalk from the beach also washed up to right in front of her door." Lauren Pallini's family lives in a home on Breezy Point that was also flood damaged. She spent Tuesday scheming how to get into the neighborhood so she could see the damage for herself. NBC News connected with her on Twitter as she started the trip over from Brooklyn. "To Breezy now," she said. Then, in Twitterspeak, "#Soscared." An hour later, she'd seen the destruction. "There's no hope for my house. Can't stop crying. I literally lost everything," she wrote. "Everything is flooded and literally everything got wet so everything is ruined."